Critical Business Intelligence In Your Inbox. Getting critical information at the earliest possible moment means gaining a competitive advantage. Monitoring sheds light on the future plans of your competitors. Set the right priorities early on and avoid wasting resources. Stay updated on recent developments of your industry, and know where innovation or cost reduction arise. Offer monitoring services and create added value for your law firm. Patentswatch does not appear to your clients, notifications and reports have your office as the sender. Generate reliable, monthly recurring income in next to no time. New work for your firm is created when e.g. a detected change requires your assessment. 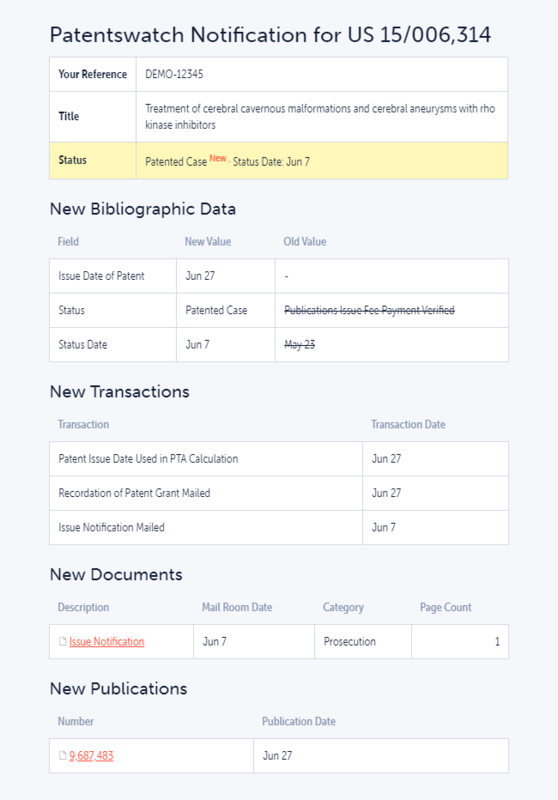 Monitor and manage patent applications world-wide in one interface. 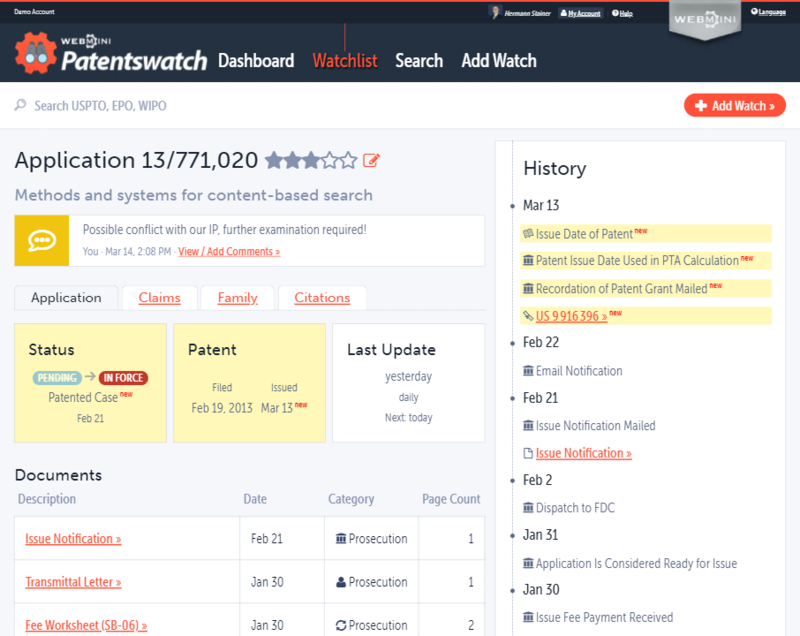 With Patentswatch, all patent data is available to you at your fingertips. The system automatically checks for and informs you of relevant news. You can also directly view patent application data within Patentswatch, with recent changes being highlighted. Add your custom reference, rating and comments to monitored applications to stay organized even when keeping track of thousands of applications. Stay on top of patent activities around you. Have peace of mind to never miss any updates regarding both existing and newly published patent applications, and always know of newest patent activities at the earliest possible moment. Patentswatch is applicable to companies from any industry, from computer technology to pharmaceuticals. It is also designed to be used by IP Law Firms for their clients. Keep an eye on competitors and gain a competitive advantage. 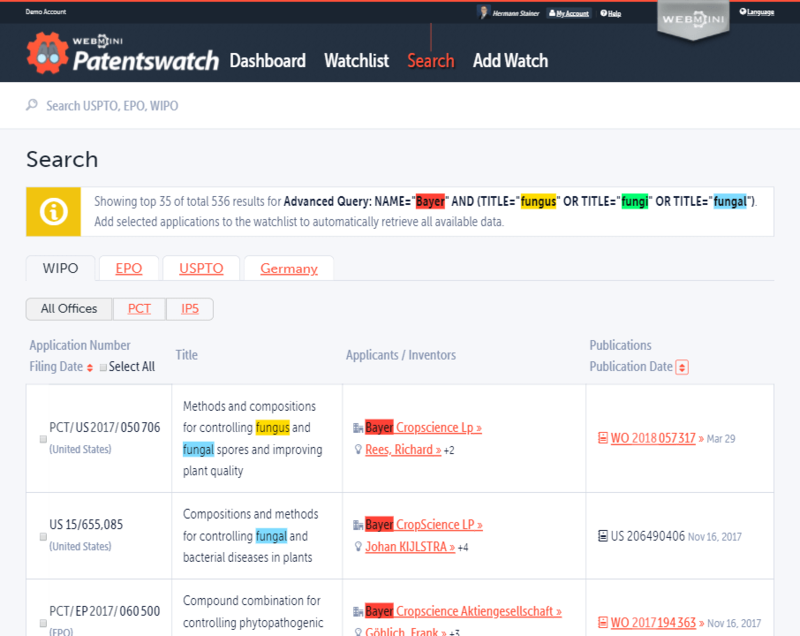 Patentswatch also comes with a powerful, yet easy-to-use patent research tool. Perform quick basic searches for specific applicants or inventors, titles, classification, legal representative, and much more. Or use the Patentswatch query language to enter complex search queries without difficulties. Add search queries to the monitoring to automatically be informed whenever new matches are found. This allows you to always stay in the loop on all activities e.g. by a specific applicant or within a certain topic. Under the hood, Patentswatch uses state-of-the-art technologies to provide you the most sophisticated monitoring service in the world, capable of taking care of thousands of monitoring tasks for you. The best part: you don’t have to worry about this. 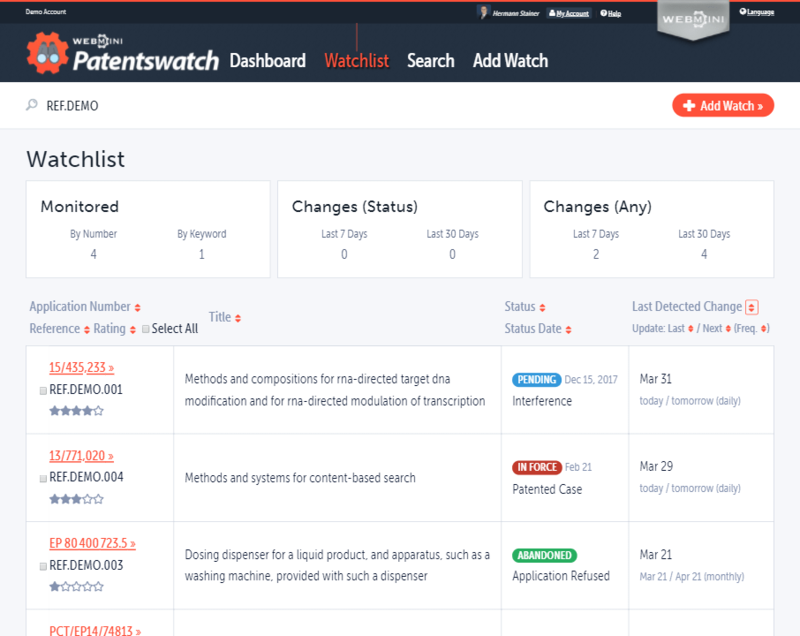 Get your work with mission-critical patent data done faster and more securely than ever before and let Patentswatch take care of the technical details.